Do you feel like you’ve just recovered from the holiday madness, and then, boom its February 14th? After New Year’s, we take a moment of relief that the holiday season is over and we don’t have to worry about it for another year. But, that little holiday in February sneaks up on us, and before we know, we need to plan something, whether it’s with our significant other, family or friends. Whether going out with the gals or looking for something romantic to do with your partner, working and learning together is a fun way to create memories this Valentine’s Day. Together, you’ll be able to have fun in the kitchen, laugh at silly mistakes and then enjoy a nice meal. It’s a way to spark a new conversation and build more intimacy with your significant other. We live in a busy world. Giving the gift of relaxation and self-care shows your love and appreciation for your partner. And what’s more loving than that? Bonus: Set the mood for a romantic evening with a limited-time only AromaRitual™ Rose Petal massage. It’s always fun to break a little sweat with your partner or friends. Go try a new fitness class your loved one has been talking about but has yet to try. It shows you’ve listened and are willing to experience new things together. Snuggle up on the couch and binge-watch a new show together. If you have kids, see if you can have someone watch them so you can have a night alone with your spouse. This allows alone time, and time just to spend a nice evening of cuddling. Pick out a game you and your friends or significant other loves, grab their favorite snacks, and have a friendly night of competition. You can create a loving bet, like loser cooks dinner. It’s a night to laugh together and build a bond. Plus, you don’t have to worry about crowds. Regardless of which idea you decide to try this Valentine’s Day, make this year special and try something new. 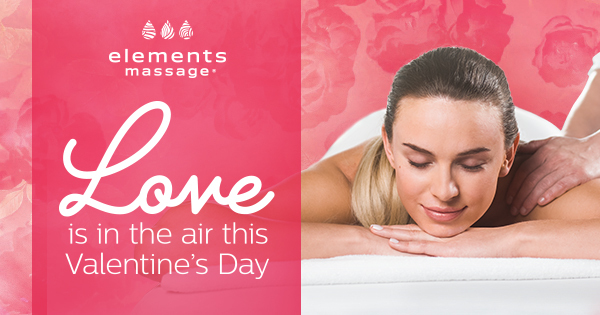 Find an Elements Massage studio near you for Valentine’s Day!